The following is a excerpt from an article appearing in the July 1998 (Volume 38, Number 1) edition of Automobile Quarterly. To order a copy of this issue, see the instructions at the bottom of this page. Permission to republish this article for the Mustang 428 Cobra Jet Registry has been granted by Automobile Quarterly. We encourage you to link to it, but please respect their copyrights and do not copy the content. Before the racing team crossed its finish line, before the muscle car had driven off into the sunset, before Tasca Ford became Tasca Lincoln-Mercury, Bob Tasca had made another truly major contribution to Ford Performance history, one that true Blue Oval fanatics will forever remember him for. Dearborn label-makers called it the 428 Cobra Jet. Big-block Chevy drivers called it trouble. A direct result of the efforts of Tasca mechanics, the 428 CJ V-8 was Ford's street performance savior. When it debuted April 1, 1968, it instantly put Dearborn's products -- specifically the Mustang GT -- right up with the best of the best in the muscle car market. Ford's "Total Performance" campaign, kicked off by Iaccoca in 1962, had earlier proven itself well -- at the track. On the street was another story. By 1966, Ford owned the racing world, but you would've never known it considering what was available on Mainstreet U.S.A.
Tasca's crew helped change all that. They had to. Their paychecks were at stake. As Bob Tasca told Super Stock magazine in 1968, "We did well from '63 to '65, when the car-buying market was a young one. [Then] the younger people [became] disenchanted with Ford's performance on the street, and stopped buying. Consequently, we had to cut back the racing budget that year." Detroit's total for high-performance vehicle (defined as cars with 300 horsepower or more) sales in 1966 was reportedly 634,434. 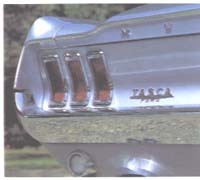 Ford's cut of that pie was a piddling 7.5 percent -- "shameful for a 'Total Performance' company," claimed Tasca in a late 1967 Hot Rod magazine report. 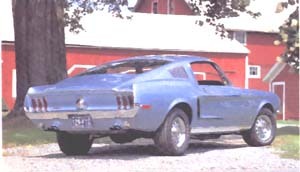 Ford's decision in 1967 to enlarge the Mustang to make room for the 390 c.i.d. big-block FE V-8 looked like a good solution on paper. In reality, it wasn't. New big-block Mustangs had barely started rolling off the trucks in the fall of 1966 when it was discovered that bigger doesn't always mean better. As Dean Gregson told Hot Rod in 1967, "We sold a lot of 390 Mustangs last fall and into the winter, but by March they dropped off to practically nothing." On dry land the big-block ponycar was no match at all for its GM rivals. "We found the car so non-competitive," continued Gregson, "we began to feel we were cheating the customer. He was paying for what he saw advertised in all the magazines as a fast car, but that's not what he was getting. So we did something about it." Actually, their solution came about by accident after a mechanic over-revved the 390 FE in a gold '67 Mustang GT coupe while "street testing" the car one night after work. In place of the grenaded 390 went a 428 Police Interceptor short-block wearing reworked heads featuring enlarged exhaust ports and 1.66 inch exhaust valves. A 735-c.f.m. Holley four-barrel went on top and that was that. Relying only on Ford parts, Tasca had created a Mustang able to post a 13.39-second/105-m.p.h. elapsed time at the strip. On street tires. With closed exhausts. Tasca people weren't shy in the least about proving this new-found performance to the public. Gregson remembers one night when the local police requested their own special demonstration. "They stopped us and told us if we didn't get that car out of town in ten minutes, they'd throw us all in jail." Gregson and his street-racing cohorts quickly complied. Bob Tasca called the car the "KR-8" - short for "King of the Road in1968." And not only did he offer the KR-8 conversion to customers, he also showed it to Ford engineers, who loved the idea. Their bosses, however, weren't so hot for it. At first. The plot then thickened. In the summer of 1967, one of those awestruck engineers spread word of Tasca's creation to Eric Dahlquist, Hot Rod magazines technical editor. Dahlquist, of course, just had to head east and see for himself, and quickly recognized how easy it would be for Ford to offer a regular-production counterpart. Additionally, he felt such a car already should have been out promoting Ford power. "It was a real shame, everything was already in the parts bins to make Ford competitive on the street," said Dahlquist in 1997. "But it was various managers within Ford that didn't understand the importance of doing this thing -- creating the Cobra Jet." He then helped them understand. The lead page to Dahlquist's November 1967 HRM article featuring Tasca's KR-8 Mustang was a ballot of sorts. At the top were two boxes marked "YES" and "NO." Instructions below told readers to "circle your choice in the box provided and return to: Mr. Henry Ford II, Dearborn, Michigan 48121." "It may be the only way," concluded the directions. The deal was done once Hot Rod pages began piling up on Henry II's desk. "It wasn't long before a Ford public relations person was calling me asking that 'I turn off the spigot,'" remembers Dahlquist. ""Enough already, we are going to build it.'" Bob Tasca had already seen to that. "Bob likes to say he was the father of the Cobra Jet, and he's right," explained engineer Bill Barr. "This time he flogged the company for what he wanted. He railed for the Cobra Jet. He supplied the noise and political pressure to get this thing going, and that prompted us to do something like he had done." That they did, although under a different name than Tasca had suggested. As Bob Sr. recalled, Iaccoca had spent some serious cash obtaining rights to Shelby's Cobra nomenclature, he wasn't going to let that expense go to waste. 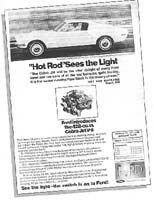 Thus, Dearborn's version of Tasca Ford's KR-8 Mustang became the Cobra Jet, undoubtedly a knock-off of Chevrolet's ever-present "Turbo Jet" references. The Bopper's King of the Road label wasn't totally ignored, however. CJ-powered Shelby Mustangs in 1968 were bestowed with the "GT500KR" moniker. The 428 CJ Mustang was a sure-fire winner. At the track or on the street. The first 50 built were special lightweight dragstrip specials. And a team of these Super Stockers, piloted by Don Nicholson, Al Joniec and Hubert Platt, took the 1968 NHRA Winternationals in Pomona, California, by storm. "Standard" Cobra Jet Mustangs were equally unbeatable down at the corner stoplight. "The Cobra Jet began the era of Ford's supremacy in performance," said Bob Tasca. "It was the fastest, in my opinion, the fastest production built car in the world at that point, and I'm not talking top speed. I'm talking fun fast, get up and go -- it was a twelve-second street machine." Eric Dahlquist agreed after watching a pre-production model trip the quarter-mile lights at 13.56 seconds. "The CJ will be the utter delight of every Ford lover and the bane of all the rest because, quite frankly, it is probably the the fastest regular production sedan ever built," he wrote in his famous March 1968 Hot Rod road test. Ford hypemasters then quoted Dahlquist , albeit incorrectly, in an equally famous 1968 ad for the Cobra Jet Mustang. They substituted "...is the fastest running Pure Stock in the history of man," a line used near the end of Dahlquists' article, in place of the original sentence's ending. What rascals. Fabricated or not, once word about the Cobra Jet got out, the Ford faithful couldn't be denied. Dean Gregson remembers selling 48 '68 1/2 CJ Mustangs alone at Tasca Ford during the first month following the April 1 introduction. "On the street, the Cobra Jet was absolutely awesome," claimed Bill Barr. "Nothing I saw anywhere could touch it. For stoplight Grand Prixes, the 428 Cobra Jet was the bee's knees because nothing could stay with it." All thanks to Bob Tasca. This is a 112 page hard cover 8 1/2 x 11 inch book that also includes an article on Larry Shinoda, designer of the Boss Mustangs.